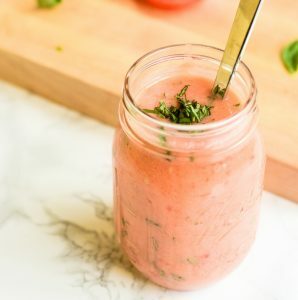 This Tomato Basil Marinade is a great way to give a summery and fresh flavor upgrade to your veggies, chicken, pork, and fish with only 5 ingredients! Tomatoes and basil are such a tried and true flavor combination. Whether it makes you think of pasta, soup, or pizza, this flavor duo is a great way to marinate your meal. Personally, I’ve found that this marinade works really well on veggies, seafood, chicken, and pork; my favorite way to eat it though is as cold leftovers on a salad. Make a superb marinade that everyone will be drooling over by mastering these culinary techniques first! How To Marinate For Maximum Flavor. Learn what makes a marinade and how to get the most out of this one! Buy & Store Herbs for Freshness. Basil is a tricky herb to store. Find out the right way to do it and get the most bang for your buck. How Long to Marinate. This marinade can be used for up to 24 hours. Find out how to adjust the time based on what you’re making. Responsibly Dispose Of Kitchen Grease. Find out how to get rid of your used marinade without clogging up your sink. All of the marinades that we’ve covered this month make one pint. If you are clever with the way you marinate, you can easily stretch this marinade out over three uses. (Hello Ziploc bags!!). If you choose a larger container to marinate in, you’ll likely end up using a lot more. With your leftovers, you can store them in an airtight container in the fridge for up to 5 days. If you would like to freeze them, this Tomato Basil Marinade will last for up to 6 months. Just a reminder, you should never reuse a marinade once it has touched your protein or veggies. This is a sure fire way to risk food-borne illness! This Tomato Basil Marinade takes almost no time to make. I recommend a large Roma tomato for the best flavor, but any delicious and ripe tomato will work. For a stronger tomato flavor, you can use roughly 1/2 cup of canned tomatoes. 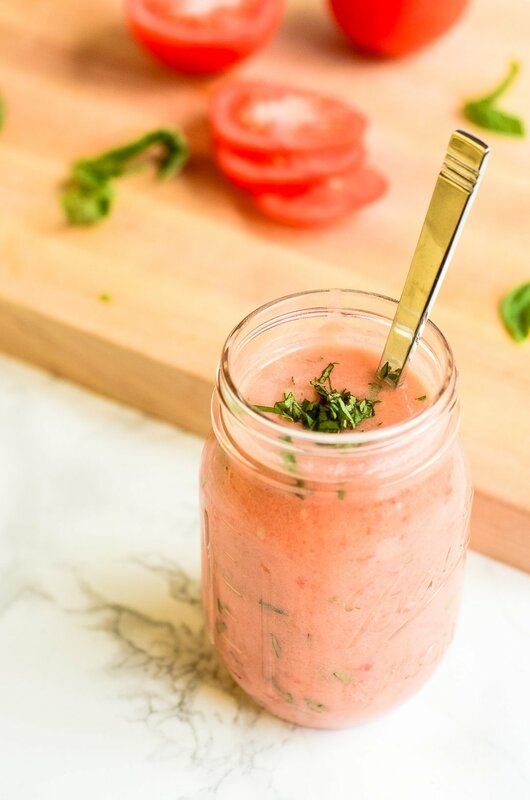 Get your free printable grocery list for this Tomato Basil Marinade recipe HERE. This grocery list has everything that you’ll need to make this Tomato Basil Marinade recipe. To help in making grocery shopping simple, each ingredient is listed in easy-to-find grocery store amounts. If there is no amount specified, that means that you can buy the smallest (or largest) container available and still have plenty left over. Brighten up your dinner in only 5 minutes with this classic flavor combination! 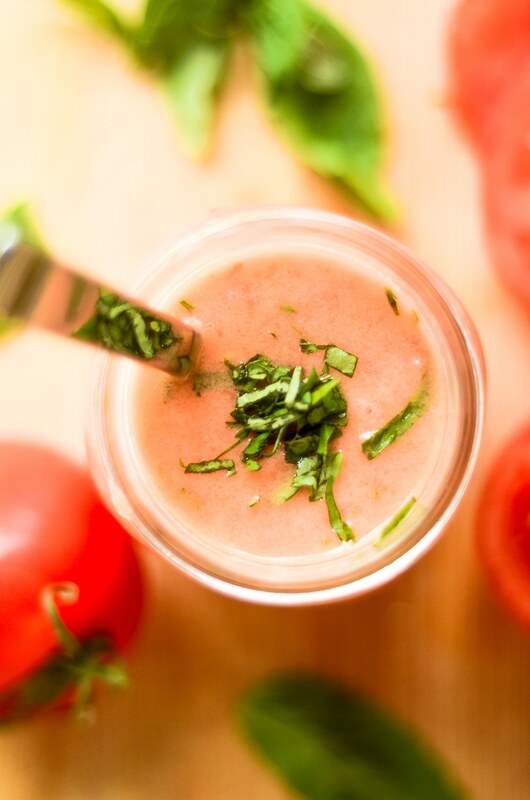 In a blender, blend the tomato, white wine vinegar, and garlic until smooth. Blend in the olive oil 1/4 cup at a time. Stir in the minced basil. In the smallest container you can find that what you are marinating will fit into (I recommend a zippered bag) pour the marinade on top until your product is completely submerged. Marinate up to 24 hours. 1 pint of this marinade covers about 3 pounds of food. This marinade is beautiful! Looks so summery and refreshing. I think it would be perfect for a light, white fish cooked on the grill! That’s a great idea, Megan! It would be delicious on a light, white fish cooked on a grill! I’m going to have to try it that way soon!